I am sorry but this letter is going to cover a disparate number of subjects. It may not be as coherent as my previous letters as I am covering a lot of territory. Please bare with me, or is that bear with me? Freudian slip? In the Past week I have observed the actions of several people I think suffer from NPD. My conclusion - that they were NPD- did not come quickly. It is easy to jump to conclusions when people first hear about narcissists and see them everywhere. No, my decision to label these two came only after years of observing them. After all, many normal people act like narcissists and vice versa. They could be male and female twins because they act the same way and I often cross their paths at official functions. These two are the "red carpet" variety of NPDs. One always tells me that he was going to show up with the Prime Minister or the Prime Minister's son. He gravitates to the important people like the sycophant he is. On a smaller scale, he could be the proverbial moocher who hangs around receptions, with his pockets stuffed with celery and dip. The second person is someone who always sits at the head table when there is an important speaker, runs up to the microphone to make introductions, and is in general a blow fly buzzing around with a sanctimonious air. She poses, like all narcissists, as if she is the queen of the ball and she gathers a coterie of people who either are impressed with her or who think she will make them look better. The two people should be married to each other. Yeah, I know the type (sigh). If you can't be them - be around them. It sometimes is eerie. Some narcissists imitate their heroes - their mannerisms, mode of speech, vocabulary, even hairdo. It's like the narcissist is an empty shell, a receptacle which assumes the shape and traits of the narcissist's idol. These narcissists are like the moon - their glow is reflected. But I must say that most narcissists would rather be famous themselves. To become a celebrity is, by far, their predominant drive. Being famous encompasses a few important functions: it endows the narcissist with power, provides him with a constant Source of Narcissistic Supply (admiration, adoration, approval, awe), and fulfils important Ego functions. The image that the narcissist projects is hurled back at him, reflected by those exposed to his celebrity or fame. This way he feels alive, his very existence is affirmed and he acquires a sensation of clear boundaries (where the narcissist ends and the world begins). There is a set of narcissistic behaviours typical to the pursuit of celebrity. There is almost nothing that the narcissist refrains from doing, almost no borders that he hesitates to cross to achieve renown. To him, there is no such thing as "bad publicity" – what matters is to be in the public eye. Because the narcissist equally enjoys all types of attention and likes as much to be feared as to be loved, for instance – he doesn't mind if what is published about him is wrong ("as long as they spell my name correctly"). The narcissist's only bad emotional stretches are during periods of lack of attention, publicity, or exposure. The narcissist then feels empty, hollowed out, negligible, humiliated, wrathful, discriminated against, deprived, neglected, treated unjustly and so on. At first, he tries to obtain attention from ever narrowing groups of reference ("supply scale down"). But the feeling that he is compromising gnaws at his anyhow fragile self-esteem. Sooner or later, the spring bursts. The narcissist plots, contrives, plans, conspires, thinks, analyses, synthesises and does whatever else is necessary to regain the lost exposure in the public eye. The more he fails to secure the attention of the target group (always the largest) – the more daring, eccentric and outlandish he becomes. Firm decision to become known is transformed into resolute action and then to a panicky pattern of attention seeking behaviours. The narcissist is not really interested in publicity per se. Narcissists are misleading. The narcissist appears to love himself – and, really, he abhors himself. Similarly, he appears to be interested in becoming a celebrity – and, in reality, he is concerned with the REACTIONS to his fame: people watch him, notice him, talk about him, debate his actions – therefore he exists. The narcissist goes around "hunting and collecting" the way the expressions on people's faces change when they notice him. He places himself at the centre of attention, or even as a figure of controversy. He constantly and recurrently pesters those nearest and dearest to him in a bid to reassure himself that he is not losing his fame, his magic touch, the attention of his social milieu. Truly, the narcissist is not choosy. If he can become famous as a writer – he writes, if as a businessman – he conducts business. He switches from one field to the other with ease and without remorse because in all of them he is present without conviction, bar the conviction that he must (and deserves to) get famous. He grades activities, hobbies and people not according to the pleasure that they give him – but according to their utility: can they or can't they make him known and, if so, to what extent. The narcissist is one-track minded (not to say obsessive). His is a world of black (being unknown and deprived of attention) and white (being famous and celebrated). No one knows if pathological narcissism is the outcome of inherited traits, the sad result of abusive and traumatizing upbringing, or the confluence of both. Often, in the same family, with the same set of parents and an identical emotional environment - some siblings grow to be malignant narcissists, while others are perfectly "normal". Surely, this indicates a genetic predisposition of some people to develop narcissism. It would seem reasonable to assume - though, at this stage, there is not a shred of proof - that the narcissist is born with a propensity to develop narcissistic defenses. These are triggered by abuse or trauma during the formative years in infancy or during early adolescence. By "abuse" I am referring to a spectrum of behaviors which objectify the child and treat it as an extension of the caregiver (parent) or as a mere instrument of gratification. Dotting and smothering are as abusive as beating and starving. And abuse can be dished out by peers as well as by parents, or by adult role models. Not all celebrities are narcissists. Still, some of them surely are. We all search for positive cues from people around us. These cues reinforce in us certain behaviour patterns. There is nothing special in the fact that the narcissist-celebrity does the same. However there are two major differences between the narcissistic and the normal personality. The first is quantitative. The normal person is likely to welcome a moderate amount of attention – verbal and non-verbal – in the form of affirmation, approval, or admiration. Too much attention, though, is perceived as onerous and is avoided. Destructive and negative criticism is avoided altogether. The narcissist, in contrast, is the mental equivalent of an alcoholic. He is insatiable. He directs his whole behaviour, in fact his life, to obtain these pleasurable titbits of attention. He embeds them in a coherent, completely biased, picture of himself. He uses them to regulates his labile (fluctuating) sense of self-worth and self-esteem. To elicit constant interest, the narcissist projects on to others a confabulated, fictitious version of himself, known as the False Self. The False Self is everything the narcissist is not: omniscient, omnipotent, charming, intelligent, rich, or well-connected. The narcissist then proceeds to harvest reactions to this projected image from family members, friends, co-workers, neighbours, business partners and from colleagues. If these – the adulation, admiration, attention, fear, respect, applause, affirmation – are not forthcoming, the narcissist demands them, or extorts them. Money, compliments, a favourable critique, an appearance in the media, a sexual conquest are all converted into the same currency in the narcissist's mind, into "narcissistic supply". So, the narcissist is not really interested in publicity per se or in being famous. Truly he is concerned with the REACTIONS to his fame: how people watch him, notice him, talk about him, debate his actions. It "proves" to him that he exists. Q. Fame and TV shows about celebrities usually have a huge audience. This is understandable: people like to see other successful people. But why people like to see celebrities being humiliated? A. As far as their fans are concerned, celebrities fulfil two emotional functions: they provide a mythical narrative (a story that the fan can follow and identify with) and they function as blank screens onto which the fans project their dreams, hopes, fears, plans, values, and desires (wish fulfilment). The slightest deviation from these prescribed roles provokes enormous rage and makes us want to punish (humiliate) the "deviant" celebrities. When the human foibles, vulnerabilities, and frailties of a celebrity are revealed, the fan feels humiliated, "cheated", hopeless, and "empty". To reassert his self-worth, the fan must establish his or her moral superiority over the erring and "sinful" celebrity. The fan must "teach the celebrity a lesson" and show the celebrity "who's boss". It is a primitive defense mechanism - narcissistic grandiosity. It puts the fan on equal footing with the exposed and "naked" celebrity. Q. This taste for watching a person being humiliated has something to do with the attraction to catastrophes and tragedies? A. There is always a sadistic pleasure and a morbid fascination in vicarious suffering. Being spared the pains and tribulations others go through makes the observer feel "chosen", secure, and virtuous. The higher celebrities rise, the harder they fall. There is something gratifying in hubris defied and punished. Q. Do you believe the audience put themselves in the place of the reporter (when he asks something embarrassing to a celebrity) and become in some way revenged? A. The reporter "represents" the "bloodthirsty" public. Belittling celebrities or watching their comeuppance is the modern equivalent of the gladiator rink. Gossip used to fulfil the same function and now the mass media broadcast live the slaughtering of fallen gods. There is no question of revenge here - just Schadenfreude, the guilty joy of witnessing your superiors penalized and "cut down to size". Q. In your country, who are the celebrities people love to hate? A. Israelis like to watch politicians and wealthy businessmen reduced, demeaned, and slighted. In Macedonia, where I live, all famous people, regardless of their vocation, are subject to intense, proactive, and destructive envy. This love-hate relationship with their idols, this ambivalence, is attributed by psychodynamic theories of personal development to the child's emotions towards his parents. Indeed, we transfer and displace many negative emotions we harbor onto celebrities. Q. I would never dare asking some questions the reporters from Panico ask the celebrities. What are the characteristics of people like these reporters? A. Sadistic, ambitious, narcissistic, lacking empathy, self-righteous, pathologically and destructively envious, with a fluctuating sense of self-worth (possibly an inferiority complex). 7. I think that the fan-celebrity relationship gratifies both sides. What are the advantages the fans get and what are the advantages the celebrities get? A. There is an implicit contract between a celebrity and his fans. The celebrity is obliged to "act the part", to fulfil the expectations of his admirers, not to deviate from the roles that they impose and he or she accepts. In return the fans shower the celebrity with adulation. They idolize him or her and make him or her feel omnipotent, immortal, "larger than life", omniscient, superior, and sui generis (unique). What are the fans getting for their trouble? Above all, the ability to vicariously share the celebrity's fabulous (and, usually, partly confabulated) existence. The celebrity becomes their "representative" in fantasyland, their extension and proxy, the reification and embodiment of their deepest desires and most secret and guilty dreams. Many celebrities are also role models or father/mother figures. Celebrities are proof that there is more to life than drab and routine. That beautiful - nay, perfect - people do exist and that they do lead charmed lives. There's hope yet - this is the celebrity's message to his fans. The celebrity's inevitable downfall and corruption is the modern-day equivalent of the medieval morality play. This trajectory - from rags to riches and fame and back to rags or worse - proves that order and justice do prevail, that hubris invariably gets punished, and that the celebrity is no better, neither is he superior, to his fans. In your letters I have found some real nuggets of truth. The inverted narcissist rings in my being, especially since I also had a narcissistic mother who liked to 'pull my strings'. She was always trying to merge and take over whatever I did; she had no respect for personal space nor did she care about my boundary. She would always repeat to me that I could never 'repay' all that she had done for me. One of her favorites was to act hurt and huffy till I was forced to ask her what was wrong. "You know what you did wrong," she would reply, which prompted me to do a soul searching guilt trip till I either found out something I should feel guilt about or I invented something to assuage her. 'Insanity is doing the same thing over and over and expecting a different result', is attributed to Albert Einstein. Is this what a victim of a NPD suffers from? A hopeless desire to change the narcissist? And does the narcissist also repeat the same game plan? Charm, capture, denigrate and then start over? Sometimes I see narcissistss as 'Velcro' people, trying to always attach/attract admirers to gain Narcissistic supply. The danger for a NPD is the victim suffering from Border-line Personality disorder who may become attached in a malignant - I love you, go away - pattern. It is called "approach-avoidance repetition complex" and is described at length in my work. I would like to balance the picture somewhat by presenting the narcissist's take on things. The narcissist is a person who is irreparably traumatized by the behavior of the most important people in his life: his parents, role models, or peers. By being capricious, arbitrary, and sadistically judgmental, they molded him into an adult, who fervently and obsessively tries to recreate the trauma in order to, this time around, resolve it (repetition complex). Thus, on the one hand, the narcissist feels that his freedom depends upon re-enacting these early experiences. On the other hand, he is terrified by this prospect. Realizing that he is doomed to go through the same traumas over and over again, the narcissist distances himself by using his aggression to alienate, to humiliate and in general, to be emotionally absent. This behavior brings about the very consequence that the narcissist so fears - abandonment. But, this way, at least, the narcissist is able to tell himself (and others) that HE was the one who fostered the separation, that it was fully his choice and that he was not surprised. The truth is that, governed by his internal demons, the narcissist has no real choice. The dismal future of his relationships is preordained. The narcissist is a binary person: the carrot is the stick in his case. If he gets too close to someone emotionally, he fears ultimate and inevitable abandonment. He, thus, distances himself, acts cruelly and brings about the very abandonment that he feared in the first place. At the risk of over-simplification: narcissism tends to breed narcissism - but only a minority of the children of narcissistic parents become narcissists. This may be due to a genetic predisposition or to different life circumstances (like not being the firstborn). But MOST narcissists have one or more narcissistic parents or caregivers. The narcissistic parent regards his or her child as a multi-faceted Source of Narcissistic Supply. The child is considered and treated as an extension of the narcissist. It is through the child that the narcissist seeks to settle "open scores" with the world. The child is supposed to realise the unfulfilled dreams, wishes, and fantasies of the narcissistic parent. This "life by proxy" can develop in two ways: the narcissist can either merge with his child or be ambivalent about him. The ambivalence is the result of a conflict between the narcissist's wish to attain his narcissistic goals through the child and his pathological (destructive) envy of the child and his accomplishments. To ameliorate the unease bred by this emotional ambivalence, the narcissistic parent resorts to a myriad of control mechanisms. These can be grouped into: guilt-driven ("I sacrificed my life for you…"), counter-dependent ("I need you, I cannot cope without you…"), goal-driven ("We have a common goal which we can and must achieve") and explicit ("If you do not adhere to my principles, beliefs, ideology, religion, values, if you do not obey my instructions – I will punish you"). This exercise of control helps to sustain the illusion that the child is a part of the narcissist. But maintaining the illusion calls for extraordinary levels of control (on the part of the parent) and obedience (on the part of the child). The relationship is typically symbiotic and emotionally turbulent. The child fulfils another important narcissistic function – the provision of Narcissistic Supply. There is no denying the implied (though imaginary) immortality in having a child. The early (natural) dependence of the child on his caregivers, serves to assuage their fear of abandonment. The narcissist tries to perpetuate this dependence, using the aforementioned control mechanisms. The child is the ultimate Secondary Narcissistic Source of Supply. He is always present, he admires the narcissist, he witnesses the narcissist's moments of triumph and grandeur. Owing to his wish to be loved he can be extorted into constant giving. To the narcissist, a child is a dream come true, but only in the most egotistical sense. When the child is perceived as "reneging" on his main obligation (to provide his narcissistic parent with a constant supply of attention) – the parent's emotional reaction is harsh and revealing. It is when the narcissistic parent is disenchanted with his child that we see the true nature of this pathological relationship. The child is totally objectified. The narcissist reacts to a breach in this unwritten contract with wells of aggression and aggressive transformations: contempt, rage, emotional and psychological abuse, and even physical violence. He tries to annihilate the real "disobedient" child and substitute it with the subservient, edifying, former version. Now, my own experience with NPD has shown me that they operate by obfuscation and confusion. Reading certain post modern philosophers is like wading through a swamp of different concepts all thrown into a soup; something like the legend of the 'stone soup' that was made to fool people into seeing and tasting something that was not there. A lot of what NPDs put out is just malarkey. In Postmodernism, there is also a lot of malarkey, although I hate to tar everyone in academia with the same brush, yet they all seem to be infected with postmodern speak. The intellectual also likes to appear more intelligent by quoting obtuse references, much like the NPD, and puts forth a superior front. In some cases there is solid wood behind the writings but in other cases, it is so much froth. Of course I could be accused of the same thing. Let us hope that I will steer clear of such foolishness. Let me rephrase that, let us steer clear of obfuscation. Narcissists are attracted to certain professions, the "public intellectual" being one of these. But what you describe is part and parcel of a larger phenomenon - the narcissist's misuse and abuse of language. fortification, a medium without a message, replacing words with duplicitous and ambiguous vocables. Narcissists (and, often, by contagion, their unfortunate victims) don't talk, or communicate. They fend off. They hide and evade and avoid and disguise. In their planet of capricious and arbitrary unpredictability, of shifting semiotic and semantic dunes - they perfect the ability to say nothing in lengthy, Castro-like speeches. The ensuing convoluted sentences are arabesques of meaninglessness, acrobatics of evasion, lack of commitment elevated to an ideology. The narcissist prefers to wait and see what waiting brings. It is the postponement of the inevitable that leads to the inevitability of postponement as a strategy of survival. It is often impossible to really understand a narcissist. The evasive syntax fast deteriorates into ever more labyrinthine structures. The grammar tortured to produce the verbal Doppler shifts essential to disguise the source of the information, its distance from reality, the speed of its degeneration into rigid "official" versions. Buried under the lush flora and fauna of idioms without an end, the language erupts, like some exotic rash, an autoimmune reaction to its infection and contamination. Like vile weeds it spread throughout, strangling with absent minded persistence the ability to understand, to feel, to agree, to disagree and to debate, to present arguments, to compare notes, to learn and to teach. Narcissists, therefore, never talk to others - rather, they talk at others, or lecture them. They exchange subtexts, camouflage-wrapped by elaborate, florid, texts. They read between the lines, spawning a multitude of private languages, prejudices, superstitions, conspiracy theories, rumours, phobias and hysterias. Theirs is a solipsistic world - where communication is permitted only with oneself and the aim of language is to throw others off the scent or to obtain Narcissistic Supply. This has profound implications. Communication through unequivocal, unambiguous, information-rich symbol systems is such an integral and crucial part of our world - that its absence is not postulated even in the remotest galaxies which grace the skies of science fiction. In this sense, narcissists are nothing short of aliens. It is not that they employ a different language, a code to be deciphered by a new Freud. It is also not the outcome of upbringing or socio-cultural background. It is the fact that language is put by narcissists to a different use - not to communicate but to obscure, not to share but to abstain, not to learn but to defend and resist, not to teach but to preserve ever less tenable monopolies, to disagree without incurring wrath, to criticize without commitment, to agree without appearing to do so. Thus, an "agreement" with a narcissist is a vague expression of intent at a given moment - rather than the clear listing of long term, iron-cast and mutual commitments. The rules that govern the narcissist's universe are loopholed incomprehensibles, open to an exegesis so wide and so self-contradictory that it renders them meaningless. The narcissist often hangs himself by his own verbose Gordic knots, having stumbled through a minefield of logical fallacies and endured self inflicted inconsistencies. Unfinished sentences hover in the air, like vapour above a semantic swamp. In the case of the inverted narcissist, who was suppressed and abused by overbearing caregivers, there is the strong urge not to offend. Intimacy and inter-dependence are great. Parental or peer pressures are irresistible and result in conformity and self-deprecation. Aggressive tendencies, strongly repressed in the social pressure cooker, teem under the veneer of forced civility and violent politeness. Constructive ambiguity, a non-committal "everyone is good and right", an atavistic variant of moral relativism and tolerance bred of fear and of contempt - are all at the service of this eternal vigilance against aggressive drives, at the disposal of a never ending peacekeeping mission. With the classic narcissist, language is used cruelly and ruthlessly to ensnare one's enemies, to saw confusion and panic, to move others to emulate the narcissist ("projective identification"), to leave the listeners in doubt, in hesitation, in paralysis, to gain control, or to punish. Language is enslaved and forced to lie. The language is appropriated and expropriated. It is considered to be a weapon, an asset, a piece of lethal property, a traitorous mistress to be gang raped into submission. With cerebral narcissists, language is a lover. The infatuation with its very sound leads to a pyrotechnic type of speech which sacrifices its meaning to its music. Its speakers pay more attention to the composition than to the content. They are swept by it, intoxicated by its perfection, inebriated by the spiralling complexity of its forms. Here, language is an inflammatory process. 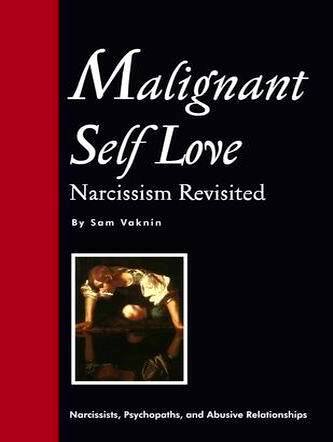 It attacks the very tissues of the narcissist's relationships with artistic fierceness. It invades the healthy cells of reason and logic, of cool headed argumentation and level headed debate. Language is a leading indicator of the psychological and institutional health of social units, such as the family, or the workplace. Social capital can often be measured in cognitive (hence, verbal-lingual) terms. To monitor the level of comprehensibility and lucidity of texts is to study the degree of sanity of family members, co-workers, friends, spouses, mates, and colleagues. There can exist no hale society without unambiguous speech, without clear communications, without the traffic of idioms and content that is an inseparable part of every social contract. Our language determines how we perceive our world. It IS our mind and our consciousness. The narcissist, in this respect, is a great social menace. Thank you for a refreshing interlude and for the timely reminder above!